At the airport, your ads will be extremely effective if you are targeting a large group of both business and leisure travellers as well as their friends and families. This is because they spend an average of 1 to 1.5 hours at the airports either waiting to depart or for the arrival of passengers. As such, your ads will garner high impressions at the media spots here with long ad-view durations. 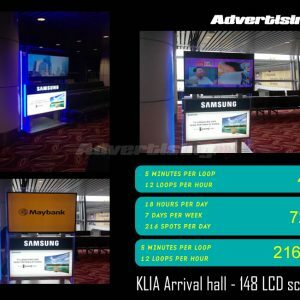 With Adverising.my, you get the best Klia and Klia2 Airport Advertising rates! Airports represent an important location for the country as it is the main entry point for visitors into the country and those who are leaving. In Malaysia, there are many airports which are operating around the country that service both international and domestic routes. The most prominent airport would be the Klia International Airport and Klia2. In the airport, billboard advertising is adopted in several scales ranging from digital poster boards to smaller boards used in trolleys and along the conveyor belts for luggage. Apart from that, billboards in airports are seen across the transit rooms, boarding rooms and along the duty-free shopping locations as well. Lightboxes are commonly seen at airports where they are very usually placed at prominent locations like the conveyor belt to collect baggage, at arrival and departure halls and other locations. These lightboxes allow you to place your ad in various sizes and illuminated from behind. If you have a loud and captivating ad that you want to spread across the wall, you can use murals at the airport. This is where passengers can see your ad when they arrive or when they are about to depart because the murals are usually located at high traffic and viewable areas. The size of the mural can be up to 42ft x 6ft in size. Basically, this is a media which is very impactful because your ad basically wrap around a large area of the wall within the airport terminal. This media is available in various shapes and sizes and can be highly effective. You will notice that there are many pillars located around all the terminals of the airport. You can sponsor any of the pillars by placing your ad as a wraparound. The more pillars you wrap, the more effective it is as your ad enjoys constant reminders. – This refers to the long walk ways in the terminal and something which passengers are sure to look. – You can place your ads on the pillars around the terminal for more effective and higher impressions. – This media can be very attractive if used well since glass panels are scattered all around the terminal. These are spectaculars which can raise the profile of your ad as they are specifically designed. The lightboxes are mounted on the walls of the terminal and very effective for repeated reminders of promotions and events. The lightboxes at the entrance of ofKlia and Klia2 are highly impactful spots if you want to create awareness with visitors to the airport. Basically, your ad can be seen when the visitors arrive as well as when they depart, leaving a lasting impression with them. This media helps your brand to stand out among others since there are so many different types of media available at the Concourse. If your brand wants something different to make an impact, this media is the perfect option. Passengers who are waiting for their baggage upon arrival spend an average of 15 to 20 minutes at these locations. Your ad will be extremely effective since they have a long duration of exposure here. Digital and static formats are available here. This refers to the spectaculars that can be placed around the corridors of the terminal. Capitalizing on the fact that most people spend an average of 1 to 1.5 hours in the airports, your spectaculars can easily reach your target audience especially if they are placed at high traffic spots. This is a unique media which can be seen by almost every passer-by at the terminal. This lightbox is double-sided which means that your ad will be exposed to the ongoing and incoming traffic of viewers at the concourse and travelators. You can practically place your sticker ads anywhere in the terminal as long as they are not obstructive and aesthetically pleasing. This media is very effective if used at entrances, boarding halls and other high traffic locations.